This is the final installment of our New Orleans Office Design trends series! Read on for the last four trends you should adopt. 7. Since management typically gets 90% of the floor space in an office, but work the least hours, cohnsider revamping, Give engineers a large conference room for collaboration and have mangers take smaller spaces since they are back and forth and in and out constantly, and usually work shorter hours. 8. Remember that every job, task, worker and project is not the same – and one size does not fit all. 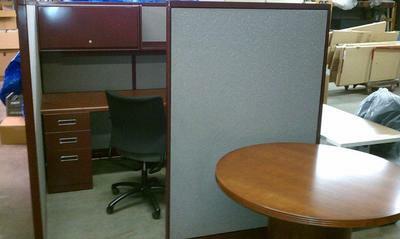 Consider staggering cubicle and shared workstation sizes to allow for those who need more or less space and amenities. Allow for interaction on every level, and pay just as much attention to privacy if required. 9. Cut out the drywall! It’s expensive, hard to change, and blocks the flow of your space. consider a hybrid blend of cubicles and open space, with closed in offices at each corner and a shared workstation and touch down center at the hub. People will be more apt to enjoy their work when the walls are shorter and they don’t feel as closed in. Go for flexibility and arrange desks so that those who have direct contact with the public ar accessible and those who need to work undisturbed are protected. 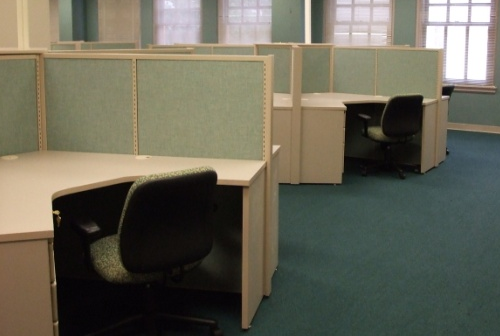 Cubicles can also be dismantled, shifted and reconfigured – the advantage of modular design is that there is never any being locked in to a specific plan. 10. Link the shell of a building and its infrastructure together, remembering that the walls affect the lighting, the sound and the mood, the lighting affects the mood, the productivity and the ambiance, the floors affect the noise level and the comfort, and the acoustics are always something to be considered. Offices designed with an eye to calm and peacefulness on average are 50% more productive than those that are not so designed. Don’t forget to take into account how your business will change over time, and allow for expansion if possible without drastically cutting existing employees’ space. Better to leave some space open and ready for new hires than to suddenly cut everyone’s space in half to accommodate! Thanks for reading. What are some trends you see in New Orleans Office Design planning? Last week we talked about the changing trends in New Orleans office design. Here are a few more to consider! 4. Provide a “Touchdown Space”. If you have employees who may pop in for a minute but don’t really need to have an assigned desk, a shared workstation with all the amenities can allow them to touch down, check in, log in if needed, plug up to a phone jack to check voice-mail or connect to the internet to check email. This can save a lot of space from being devoted to someone who is around for a few minutes at the start and end of each day. 5. Rethink technologies and consider using blended space for employees who need a place to meet for a moment.. A workstation for four with a conference phone, plenty of room for laptops and tablets and a screen for video calls makes teamwork a snap and doesn’t require the use of a huge conference room. his can be centrally located and used for all sorts of small meetings without needing to go to another wing or floor. Design so that no-one is more than 15 feet away from a phone jack, internet connection, printer or filing cabinet. Keep old files and new ones separate and improve the speed at which each team can work. 6. Take actual potential activities into account when designing space. Replanning buildings based on what people actually do instead of by preconceived conceptions of what an “office space” should look like can increase productivity and contentment. If someone can be up and moving during part of the day, many issues can be circumvented – among them stiffness, burnout, and even obesity! Having smaller workstations plus room for a touchdown, a conference, a private space for a break or a medication administration are all ideas we’ve touched on – but why not expand it to a library/media center, a quiet room where people can relax while waiting on a meeting and enjoy wifi, and other amenities that allow them to work where they want instead of being chained to their desks? Check in next week for our final four New Orleans office design trends! 1. Collaborative space is a flexible thing. Everyone’s heard the stories about how cubicles stifle creativity but open office plans create chaos. True collaborative effort isn’t the norm in every industry, and many people work best undistracted. That said, even cubicle space can be adapted with varying heights and layouts to make it easy for workers to confab when needed and share ideas as well as space.Moving away from an open floor plan doesn’t have to mean a death knell for energy and spontaneity, all you have to do is remember who is trying to do what and within what parameters, and take into account that not everyone has the same work style, and design accordingly. 2. The big private office for everyone is out. With the sky-high cost of commercial real estate these days, most companies simply can’t afford the footprint for individual walled offices with a window view. 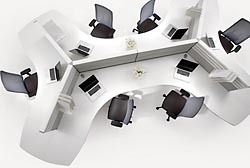 Smaller workstations arranged in a pattern around a central conference room or in a varying pathway format for ease of communication can serve just as well and prevent people from feeling like their autonomy and sense of personal space is completely gone. An alternative work environment allows team members to work together when needed and retreat when serious focus is required. 3. Shared break space is important. When everyone arrives at work, pulls their chair up to their desktop,and spends even lunch at their desk, social interaction suffers. consider footprints and shave a foot off of every workstation in a ten unit row, making 9X9 workstations measure 8X9. The remaining 10X9 space can be converted into a tiny lounge with a small table, two chairs, and a phone extension as well as a shelf for items or a coffeepot. Add a plant for character and people can spend at least a few minutes away from their desk getting to know a co-worker when needed. Add a door, and this space also provides privacy if an employee needs to make a personal call while on break, take medication, etc. Check back next week for three more New Orleans Office Design trends! The structure of an office layout isn’t just about office hierarchy or the division of public and private areas. The way your office is laid out is an actual extension of your brand and can say a lot about your company as the product or service you provide. When planning an office layout, you will naturally consider the style and appearance factors, but to be effective a layout also needs to respect the information flow to ensure every worker performs at optimum capacity. A Modular Workstation Layout lets you go wild with a variety of pieces that can be mixed and matched to divide space into workstations. Each office can be tailored to suit the specific duties of the occupants. 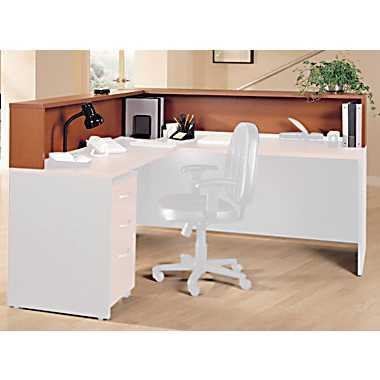 A Cluster Workstation Layout focuses employee workstations around a central core. Dividers can be distributed from a hub, and arranged them in a pattern similar to the spokes in a wheel. This type of system is most effective in an office where don’t spend all of their working day at their desk. A Landscape Layout is used in Germany extensively, and depends on a combination of cluster and modular styles with the addition space elements, ambient lighting and plants and foliage often used as visual barriers Most organizations use a hybrid approach with a ratio of approximately 80:20% open to private areas. An Open Plan Layout may have higher levels of noise pollution, but may also have better levels of communication. This style of layout is more appropriate for offices with computer based tasks rather than telecommunications. This structure helps enforce a sense of teamwork and allows clear lines of collaboration. A Traditional Closed Office Layout is the typical plan for offices housing upper management. This is still common in many industries but for large offices the cost per square foot may decrease its attractiveness. What kind of office layout works best for your needs? Share with us what you like and dislike about your layout, and how you think things could be improved.